VERC Enterprises, a car wash, convenience store, and Mobil/Gulf/Irving gasoline operator with locations throughout eastern Massachusetts and New Hampshire, received the President’s Award from the May Institute during its “An Evening of Hope & Possibility” held at The State Room in Boston April 4, 2019. The May Institute, based in Randolph, is a national leader in the field of applied behavior analysis, serving individuals with autism-spectrum disorder and other developmental disabilities, brain injury and neurobehavioral disorders, and other special needs. It created the President’s Award to recognize and honor individuals, organizations, or corporations who have achieved professional distinction through hard work and a strong commitment to bringing respectful awareness to and support of special needs. 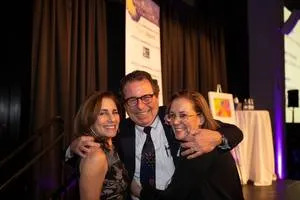 Leo Vercollone, CEO of VERC Enterprises accepted the award on behalf of the company that has committed to comprising 20 percent of its workforce with individuals who are intellectually and developmentally disabled. “I speak for the entire VERC Enterprises family when I say that this distinction makes us all proud and at the same time humbled — and further strengthens our commitment to be a leader in hiring those with intellectual and developmental disabilities,” said Vercollone. and Jolie Beaupre, parent and featured event speaker.